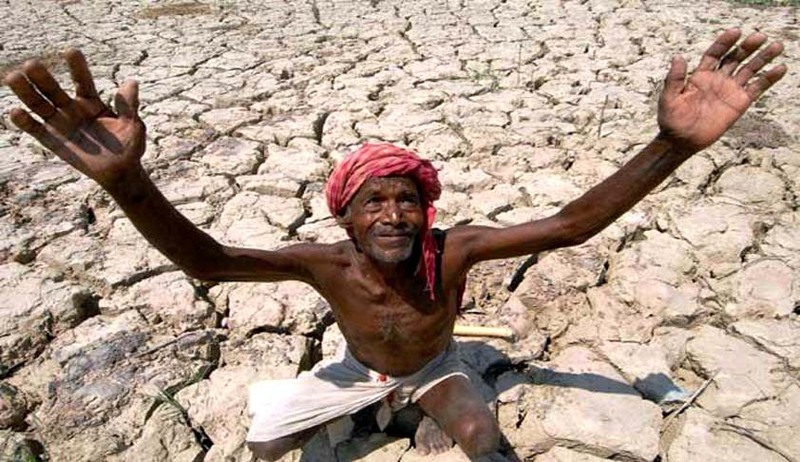 The Supreme Court passed landmark orders in May after hearing Swaraj Abhiyan’s petition seeking directions to the Central and State Governments to provide timely and effective relief to drought affected people in several States. The Supreme Court, after passing orders, in the case, decided to monitor its implementation. In a subsequent hearing, Swaraj Abhiyan brought it to the notice of the Court that many of its orders have not been complied with in letter and spirit. As the Supreme Court bench comprising justices Madan B.Lokur and N.V.Ramana is likely to hear Swaraj Abhiyan’s contempt petition in the matter at 2 p.m. on October 24, the Abhiyan - which has converted itself as a political party on October 2 - has planned a unique stir to draw attention to the non-compliance of the Governments to Supreme Court’s orders in the case. On Sunday, October 23, farmers from the drought-affected districts will measure the distance from the Supreme Court to Krishi Bhavan, where the Ministry of Agriculture is located, and check why the “historic SC order has not yet been implemented”. Described as Niyat Ki Napai, the unique stir, according to Abhiyan sources, will calculate the speed of “this snail-paced Government and check why the claims of good governance are falling flat when it comes to ensuring relief to farmers and rural people”. More than five months after the Supreme Court passed verdict in the Swaraj Abhiyan drought relief case holding that right to receive relief is a constitutional guarantee, farmers have planned this innovative way to symbolically measure the intent & efficiency of Central Government in implementing the order, said Abhiyan sources. The Central Government and the State Governments have virtually done nothing to give relief to the drought affected people even after the passing of such a historic judgement, Swaraj Abhiyan has alleged. “The governments at the most have only been interested in completing the formal compliance on paper as the distress of rural population continues. There is widespread shortage of food. There are reports of malnutrition deaths from several states. There is acute shortage of livelihood opportunities under MNREGA and neither crop loss compensation nor any other monetary relief has been extended. Recovery of farm loans continues in crude and cruel manner despite clear orders of the Supreme Court that this should be stopped. In the circumstances, farmers and rural people are extremely disturbed, unable to understand why despite clear Orders of the Supreme Court, the Central Government and the State Governments are not providing them with the necessary relief”, Swaraj Abhiyan’s press release says. Farmers from several states such as Uttar Pradesh, Haryana, Punjab and Delhi have decided to congregate in front of the Supreme Court at noon on Sunday, 23rd October, 2016 and to carry out a Niyat Ki Napai exercise by measuring the distance from the Supreme Court to Krishi Bhawan and assess for themselves how long it has taken for the Orders of the Supreme Court to reach Krishi Bhawan, the press release adds. The movement of the Apex court's order on per day basis will be computed and the farmers would inform the nation about how snail-paced this Government is when it comes to ensuring relief for farmers and rural India. Swaraj Abhiyan’s decision to take to the streets, when the Supreme Court is monitoring the case, and is scheduled to hear it on October 24, is expected to create some heat during the hearing.